The transition from Inis Mor to Galway was difficult, too much noise, too many people. Not so with Glasgow. On the way from the airport to my hotel, the cab driver made suggestions about what to do during my stay. He told me “I love my wee city.” I’m in love too. As the plane from Dublin landed in Glasgow, rough grey clouds filled the sky. 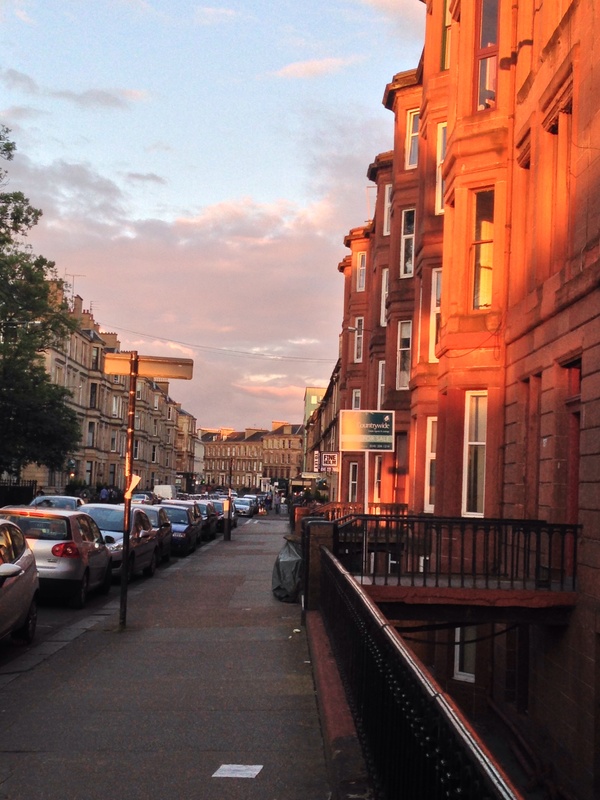 Out of the windows on the left, was a tangle of rusty red blocks that is Glasgow. On the right, the moody sky sat over blue green hills surrounding a small loch, its waters a silver reflection of the sky. I hadn’t left the plane and I was already infatuated. My hotel is excellent, tidy, an almost charming attic room with a good bathroom. By pure luck, I am in a perfect location in the West End: a block away from Kelvingrove Park with a stream running through it, the Kelvingrove Art Gallery and Museum, and up the hill through the park the University of Glasgow. If I walk along Sauchihill Road, I pass the Center of Contemporary Art which becomes pedestrianized and ends at the main thoroughfare, Buchanan Street, also pedestrianized. At it’s end is the River Clyde. On my first night, I walked through the park to University Avenue in search of a restaurant, Stravagin. It reminds me of Agricola in Princeton in terms of its’ long tablels and high stools, but there the comparison ends. It is less “designed” and more interesting. I sat in the loft area looking down at the wooden tables and the customers that freqented them. I began my meal as I have several times during my stay in Scotland with whiskey. Then I had an excellent meal of sea bass. The man in the table next to me leaned over as he was leaving to tell me he had ordered the same and it was excellent. I was delighted with his friendliness and even, perhaps, with the bit of attention. As the evening wore on, I could see he was, indeed, a very friendly man. At least in his late fifties, he managed to sit beside two young woman and insert himself into their company. They were polite but didn’t encourage him. After several unsuccessful attempts, he started looking up at me. I guess I shouldn’t be so easily beguiled. On my walk home, as I looked over the wall next to the park. 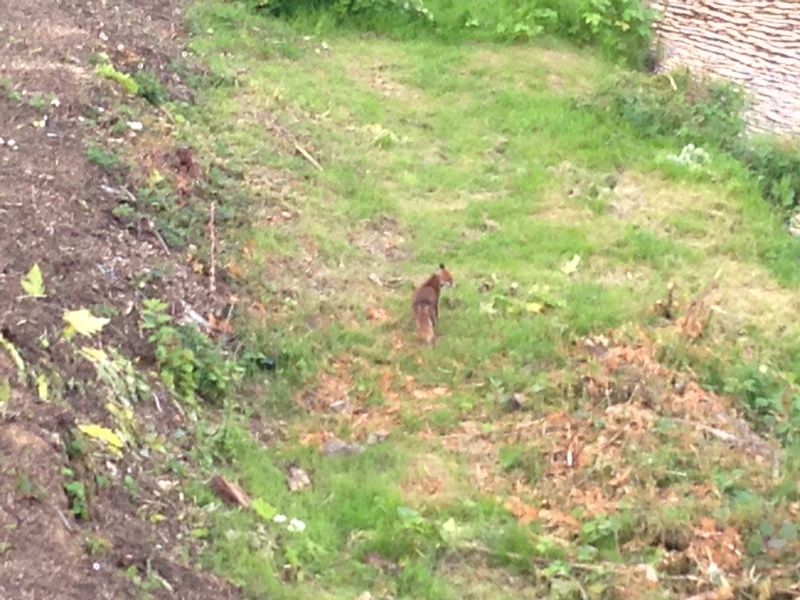 I sighted another fox, this one had four legs. He too seemed to be licking his wounds. He had been stalking a duck who managed to escape. Just as the man had looked up at me after his failure, the fox looked longingly over it’s shoulder at the meal that got away.